The military warned protesters to go home or face "serious action"
Nine people have been killed during Thursday's crackdown on anti-government protesters in Burma's main city of Rangoon, state media say. The dead included eight protesters and a Japanese man, identified as a video journalist working for APF News - with 11 demonstrators and 31 soldiers hurt. The deaths came on the 10th day of protests, led by Buddhist monks. World leaders have renewed calls for sanctions - and the US says it is beginning with 14 top officials. President George W Bush has "made it clear that we will not stand by as the regime tries to silence the voices of the Burmese people through repression and intimidation," said Adam Szubin, director of the US treasury's Office of Foreign Assets Control. 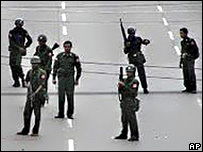 Apart from sporadic gunfire, the streets of Rangoon are now said to be quiet after six hours of clashes. A curfew is back in force. Thursday's violence followed reports of overnight raids on six monasteries. What next for the regime? At about midday (0530 GMT), tens of thousands of people poured onto the streets in an apparently spontaneous show of defiance, singing nationalist songs and hurling abuse at soldiers driving by in trucks. Troops began firing warning shots when protesters tried to take their weapons from them, state television reported. Witnesses said it was unclear whether the bullets were fired into the crowd or above heads. Japan's foreign ministry confirmed that a man found dead in Rangoon carrying a Japanese passport was Kenji Nagai, a video journalist who had been in Burma for Tokyo-based news agency APF News since Tuesday. Japan would officially launch a protest with the Burmese government over Mr Nagai's death and demand an investigation into the incident, Japanese news agency Kyodo quoted Chief Cabinet Secretary Nobutaka Machimura as saying. The official toll was nine dead, though this could not be confirmed. In unrest on Wednesday state media said one person had died, though there were unconfirmed reports of several other deaths. The scale and growing momentum of the protests appears to have taken Burma's military rulers by surprise, says the BBC's regional correspondent Charles Scanlon. By ordering combat battalions into the streets, they are aiming to intimidate the population while rounding up the leaders of the protest movement, he adds. With fewer monks on the streets on Thursday, the military may have had fewer qualms about firing on the civilians, correspondents say, as monks are held in high esteem in Buddhist Burma. Analysts fear a repeat of the violence in 1988, when troops opened fire on unarmed protesters, killing thousands. The current protests were triggered by the government's decision to double the price of fuel last month, hitting people hard in the impoverished nation.